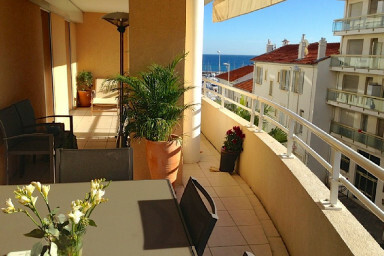 Spacious two bedroom apartment with large balcony near the beach, garage parking. Here, you will feel at home whether you’re in Cannes for holiday or for any of the congresses and festivals held here throughout the year. Everything is made to make your stay as relaxing and stress free as you would expect from a holiday on the Riviera. The apartment is located in a new and modern house with high standards in both floor plan and equipment and with a private garage parking in the building. You have two separate bedrooms, a large living room with an open kitchen with all equipment you may need. All rooms are well furnished and decorated in light colours and in a contemporary style. The terrace extends along the entire apartment with access from all rooms. Just open the balcony door from the bedroom in the morning to enjoy the morning sun and the view of the Mediterranean Sea. As the terrace is large and covered you can enjoy all meals here, from breakfast to a late night supper. A great place to wind down on the sun beds after a hectic day, drinking a glass of wine together with your family and friends. The apartment is located Palm Beach in a calm area close to the beach. Palm Beach has its own little community at the end of the Croisette with shops and restaurants, with beaches on 3 sides of the headland. Public beach just out the door of the apartment with sailing and water sports club up the beach. The city centre is only a few minutes away by bus (bus stop just outside the door) or a 25 minutes walk along the Croisette. The open-topped bus (bus no.8) is perfect to travel along the Croisette, between Palm Beach, the Palais des Festivals and the other end of the Cannes bay. More like a sightseeing tour then an ordinary bus trip. – Palais des Festivals: 10 min (by bus), or 25 min (walking). – Bus station for airport coaches: 10 min by taxi or bus.